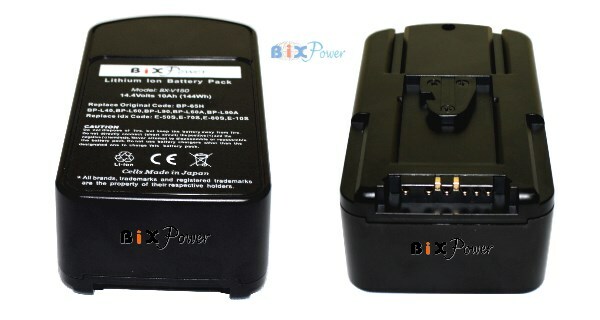 This is a 144 Watt-hour high capacity 14.4V 10Ah lightweight V-Mount battery for professional camcorders. Made with premium Panasonic lithium ion battery cells, it has a 5-level LED indicator to allow the user to see the remaining power before mounting to the camera. This battery also has a D-Tap DC port for using as an alternative charging port or output port. You can order the battery with our Portable AC Charger. The portable AC charger will charge the battery through the D-Tap port on battery through a D-Tap cable, which will be included with the charger. Optional Portable AC Charger: Small size: 4.7" x 2.4" x 1.3". Light weight: 10 oz. AC Charger is optional. It is not included with standard package. This is a great battery. I used a pair of these recording outdoors in South Africa recording continuously for 2 weeks without incident. In many cases, they were left outside for days in a plastic tin unattended. I have only had these for about a month, so I do not know yet how long they will hold a charge or how the performance will degrade, but for my purposes, they have already proven their value. I have had similar experiences with other BiXPower products.